I hope this issue finds you and your families enjoying the holiday season. I know it's a busy time of year with many things to do. However, there are also a number of things on my “Christmas Wish List” this year! 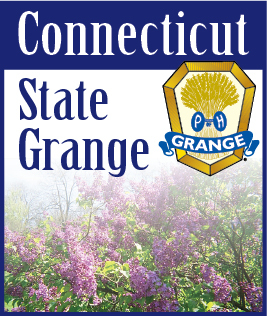 First, there are at least 10 Granges that have not responded to my multiple requests for State Directory information. To my knowledge, only one Pomona has produced a program book this year (Nutmeg) so the remainder of the State can only be contacted if we have accurate information printed in the State Directory. Ideally this book would have been out by now but it is in limbo due to the lack of information. Don't worry about filling out the official form, just send me a list of your officers, committee members and the addresses, phone numbers for them and I'll take it from there. My thanks to all of the Granges who have responded. If we do not receive the information I will have no other alternative than to go to print without. A letter was sent out to all new State Committee Directors requesting Blue Book information for this year. Thank you to all who have sent theirs in. If you have not, please let me know when it can be expected so we can plan for the Blue Book. There are a number of Granges who have not sent in their dues for the third quarter (ended Sept. 30). We do not hold up our report to National because of outstanding Granges and have no choice but to pay dues based on the last figures provided. This means if you have had a loss in membership, we are paying too much to National. Please send in your dues on time. We have received the communication of the new 2019 Annual Words. Granges paying their dues for the fourth quarter, will receive the new words with the new form. Please remember the new word should be put into use beginning in February. The 2019 Dues Receipts were sent in to all Granges (who needed them) in early September. There is a large number who have not remitted their payments. If you have, thank you, if not, please do so soon. We expect to receive the annual Bonding Notice from National Grange and we will have that out to you as soon as it is received. Please keep in mind that like the dues, we make one lump payment to National Grange regardless if payment has been received from all of our Granges. I received a lot of questions about the Pomona Incoroporations. Unfortunately it is still in the hands of our attorneys in Hartford. They were working on the necessary changes to the by-laws of each Pomona to make them more compliant with the requirements of the IRS and the State of Connecticut. As soon as I know more, we will get that information out to all of you. Thank you for your patience. Thanks for reading and listening to my concerns. I hope all of you have a wonderful Christmas and a prosperous New Year!